If your best friend, brother, or any other personal connection has asked you to be their Best Man, congratulations. This is one of the highest compliments that can be paid to you. Of course, your idea of a “compliment” may not be having to give a good speech in front of a group people. Some of whom you’ve likely never met before in your life. On top of the normal stress associated with having to speak in front of others, your Best Man speech will be remembered for years, and is likely to be recorded on video as well. To sum it up, your Best Man speech has to be perfect. But here’s the problem: most of us only get the chance to be a Best Man maybe once in our lives. It’s not like you have a ton of experience in putting together great speeches. Add to this the pressure to perform in front of others without breaking a sweat, and suddenly an event that should be the time of your life is stressing you out. Instead, you should enjoy the role of being chosen as Best Man. It’s an honor. And on top of the fact that you should be having fun with it, you don’t want to let down the bride and groom, either. Now, imagine if you could sit down with someone who’s delivered hundreds of Best Man speeches, and be given crystal-clear directions on how to whip up the perfect speech and knock it out of the park…making your friend’s wedding that much more memorable. “This astonishing package answers all your questions, shows you all the short-cuts, and gives you a quick and easy paint-by-the-numbers method of making a fantastic Best Man speech -- even if you can't write anything more than a grocery list or your own name -- 100% Guaranteed!" 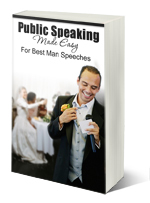 Best Man Speeches Made Easy gives you step-by-step techniques for using jokes, stories and quotes that will rocket your speech above the bare essentials. Not only will you quickly learn how to piece a fantastic speech together, you’ll also enjoy the process. What To Do, Step-By-Step, Until You Succeed! The 20 pre-written speeches are easy to customize, and allows you to prepare yourself in no time flat. So instead of dreading and worrying about having to perform, you’ll be rested and excited about the wedding. 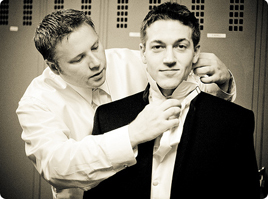 Best Man Speeches Made Easy will answer any anxieties you may have about making the speech. It offers guidance on speech-making essentials, grand openings, strong middles, big finishes, plus quickly putting it all together and delivering the speech itself! You’ll discover how to whip together the perfect Best Man Speech in an in-depth, word-by-word, step-by-step and “fill in the blank” process so you feel comfortable doing it, even for the very first time. You see, bad Best Man Speeches don't simply happen. There is always a reason that they failed. Find the reason and discover the solution. That's why this package was put together. The result is an arsenal of easy to apply solutions and strategies that I know will help you write a killer speech. If you’re struggling to think of a good way to phrase something, then look no further. This hot collection of over 180 quotes and one liners gives you plenty of ways to add spice to your speech. You can use them “as is” or to get your creative juices flowing. Also if you want to lighten the mood and keep the audience’s attention, then humor is a must. You don’t have to be a professional comedian to have them laughing up a storm. Here are tons of jokes and riddles you can quickly insert into your speech. Writing the Best Man Speech is only half the battle. The task of delivering the speech in front of family, friends, and strangers can still be daunting. If the thought of speaking in front of others leaves you terrified, and you’re scared you’ll be tongue tied or make mistakes then this guide is for you. By following a few pieces of simple advice, you’ll erase your fear and turn the event of giving your speech into something memorable. Extra Bonus - includes video and audio version, almost a course in itself. The responsibilities of Best Man aren’t limited to standing next to the groom and delivering a five minutes speech. 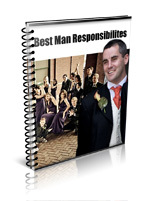 You have a variety of duties before, during, and even after the wedding. Here is a comprehensive list of responsibilities that you must be aware of, so that you can plan ahead. Planning and executing the Bachelor Party can be even more stressful than planning your speech! You want it to be fun, memorable, and to pull it off without having any problems. Simply put: throwing a bachelor party is a ton of work. You have to be organized and know what to expect. 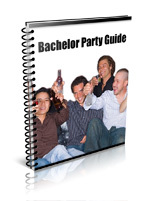 This guide shows you step by step how to give the groom a Bachelor Party that he’ll never forget! For those of us that don't like reading, or just plain don't have the time, this bonus of complete audio versions of all material in this package (in MP3 format) is perfect. Listen to the course in the car, or put it in your MP3 player (iPod / iPhone / Zune, etc) and take it with you on the go. These audio recordings were done by a professional voice over artist so they are studio quality and easy to listen to. You get to actually hear how the speeches sound as they are being delivered. So you can more easily visualise yourself presenting them. While you listen along, you'll find yourself saying "I really like that opening", and "I can use that closing for sure" and before you know it you've mapped out the perfect best man speech for the wedding. As an extra bonus to really make sure that your speech is as good as it possibly can be, you can email your finished speech to: steve [AT] bestmanspeeches.net for a review. This bonus alone is priceless. I can’t tell you how many times I’ve rescued a best man who thought they had the perfect speech, but upon my review, were missing critical aspects that would have embarrassed them at the wedding! Listen, you won’t see anyone else offer this to you. I’m willing to do what others won’t: personally review your speech, and give you individual advice on how to “knock it out of the park”. If you follow the guidelines in this book, you probably won’t need your speech reviewed, but just in case you feel you need it, it’s here for you. Total bonus value of $235 included with this package, that you get for FREE. Want to read up on what other Best Men have been saying? I have many more testimonials I can email to you upon request. I don't even ask for feedback, they send it to me because they loved this book so much. E-mail me to read about more satisfied Best Men! “Bed Of Nails” Money-Back Guarantee! If you don’t value this product so much and what it can do for your Best Man Speech, that you wouldn’t lay on a bed of nails and let an elephant walk over the top of you to keep it, then ask for a refund within 60 days and I’ll give you 100% of your money back no questions asked, you even keep the entire package as my way of saying thank you. Your purchase is 100% Satisfaction Guaranteed or your MONEY BACK! That works out to less than the price of a coffee or hamburger per speech, not to mention all the openers, closers, toasts, jokes, and other bonuses that you'll have instant access to. Professional Speech Review: If you follow the guidelines in Best Man Speeches Made Easy, you probably won’t need your speech reviewed, but just in case you feel you need it, it’s here for you. Wow, that’s a LOT of incredible material for only $47... and best of all, you get instant access to it in the form of a quick and easy download, no need to wait for shipping. Now that I’ve shown you the mountain of incredible information you get with this deal…and how risk-free it is with my 60 day “bed of nails” money back guarantee…the next move is up to you. Seriously, if you’ve read this far, than you obviously have a strong interest in making sure you put together the Best Man Speech that your groom deserves. All that’s left is for you to take action and invest the $47 right now. P.S. – You won’t find a package anywhere else like this one! 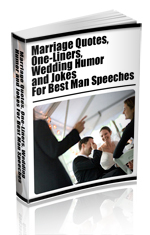 You get Best Man Speeches Made Easy, Marriage Quotes and One Liners, Wedding Humor, Public Speaking Made Easy, Best Man Responsibilities, and Planning And Executing The Bachelor Party for INSTANT DOWNLOAD ON YOUR PC OR MAC! Don't forget, for those that don't like or have time to read, everything is also in Audio MP3 format ready to put in your car or your MP3 player, recorded by a professional voice over artist, so you can listen your way to a great speech. And if that wasn’t enough, I will PERSONALLY REVIEW your speech and give you impartial one on one advice on perfecting it! Absolutely nobody else offers this. You get all of the above for the low investment of only $47, and don’t forget that your purchase is backed by my iron clad “bed of nails” money back guarantee for a full 60 days. You have nothing to lose and everything to gain, so don’t let the groom down on the most important day of his life... own your copy right now!